Sweet Romance Reads: Which pen do you use to write? I spend my days surrounded by fountain pens because that's my day job. As I've worked with high-value writing instruments pretty much all of my working life, I pay a lot of attention to the pen I use. I enjoy to touch them; I enjoy to write with them; and I don't like to use cheap throw-away ballpens you can get at every corner. I ban them from my house, much to the chagrin of my husband who hardly ever notices what he's writing with. 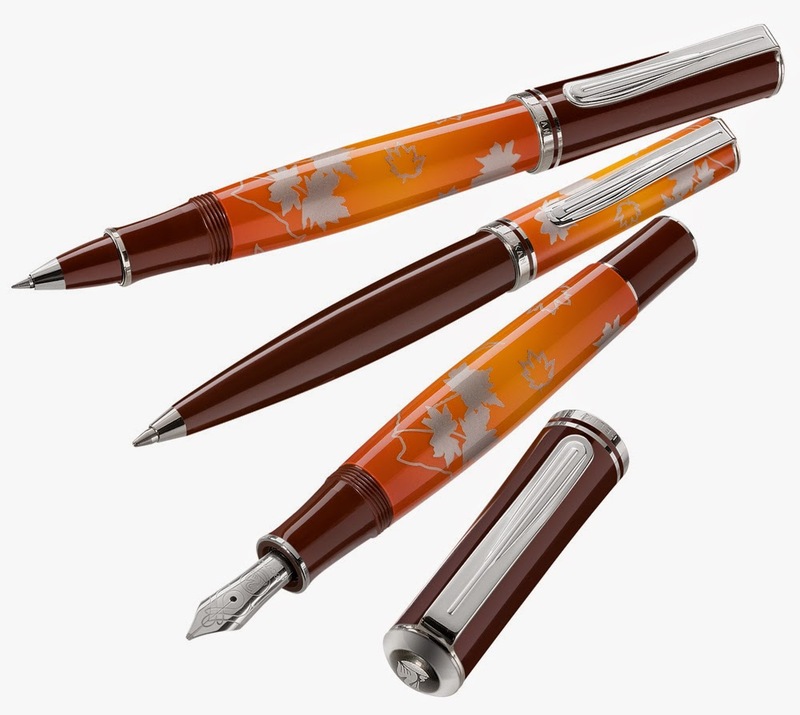 Understanding my passion, though, he offered me a particularly nice fountain pen for my birthday, the Special Edition Indian Summer from Pelikan which is now sold out. Its barrel shows autumn leaves as my birthday is in autumn; it has gorgous colors that make me happy even if the weather is so bland it brings me down, and it writes like a dream. I filled it with "brilliant brown" ink as the finishing touch - and now I enjoy taking notes more than ever. Besides my fountain pen, I love pencils. They are so . . . forgiving. And flexible. I like that concept of erasing things and starting again. If you look at the tools a writer has to have, a keyboard is certainly more important than a pen . . . but we all take notes whereever we go; we all love to have pen and paper within reach to make sure our darting ideas don't escape before we catch them. However, I can't write with rollerballs. I slant the pen too much. And I don't like to write with ball pens because you have to use so much pressure. How about you? Do you write with fountain pens at all? Do you prefer rollerballs or ball pens? Or even pencils? Do you have a much-loved pen that you never want to lose? Or it it all the same to you as long as the thing writes? Beate Boeker is a USA Today bestselling author with a passion for books that brim over with mischief & humor. Many of her sweet romances and cozy mysteries are set in beautiful Italy. She's a global marketing manager with a degree in International Business Administration, and her daily experience in marketing continuously provides her with a wide range of fodder for her novels, be it hilarious or cynical. I haven't written with a fountain pen for years. I tend to use ball point pens. What a lovely pen in your picture! Thank you, Helen! You should try it again soon - it's a great feeling. Pen, what's that? Kidding, but I do everything on computer or tablet these days. I keep lists on the computer or my phone, too. Deleting or highlighting finished/purchased items gives me just as much joy as crossing them off on paper. Like most of the others, I spend much of my time on the computer. I use disposable pens for list making and in my purse - and I have a few favorite pencils!